NCAA issues its best decision…ever? In a story breaking late Friday evening, the NCAA “denied the Football Rules Committee’s proposal to require an institution’s uniform to be a different color from the field of play.” This means that Boise State can wear its blue uniforms at home games, at least as far as the NCAA is concerned. This is one of the first topics ALDLAND tackled, way back on August 3, 2011. 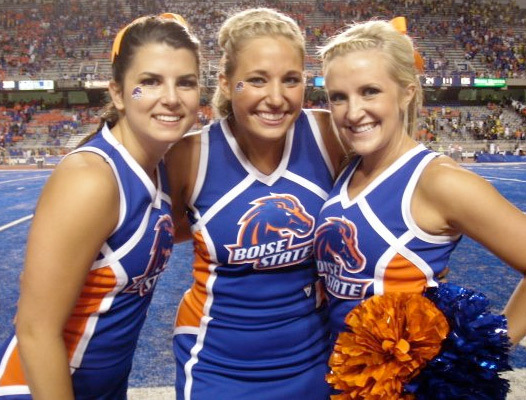 At that time, BSU was just about to start its first season as a member of the Mountain West Conference, which didn’t make its new member feel welcome by issuing a bill of attainder prohibiting the Broncos from wearing blue at home conference games. As I pointed out then, the rule made no sense, since the conference permitted member Colorado State to wear their green uniforms at home conference games, and CSU has a green field. It’s also as good a time as any to remind people that the players don’t operate from the vantage point of the Goodyear Blimp while playing the game. The NCAA’s recent decision to reject a proposal that ALDLAND has shown to be nonsensical, unworkable, and flawed may be the best decision in its history. As the internet will tell you, though, the bar is pretty low. We nevertheless take a moment this evening to applaud the high point of Mark Emmert’s tenure as NCAA president. This pour of Woodford is not for you, Mark, because that would constitute an improper benefit. To much fanfare, South Carolina and Vanderbilt opened the college football season last Thursday, and the Gamecocks survived on the road, leaving Nashville with a 17-13 victory. Beside the blatant non-call on a critical pass late in the game, Vanderbilt had little excuse for losing this game. They missed a field goal that would have given them the lead in the first half, and based on the overall level of play, they really should have taken a lead into halftime. The Commodore defense showed its strength, and knocking SC starting quarterback Connor Shaw out of the game proved to be one of their best decisions, as his backups were worse than useless. Shaw didn’t stay out long enough, though, and he proved to be enough of a threat, even with a bum shoulder, to lead his team to narrow victory. For more analysis, read this. Also, did anyone else notice Spurrier wearing a normal ball cap to start the game? That pretty much sums it up. Not a lot of glamour for either team in this one, but Michigan State’s defense is going to keep it in some games this year in which it otherwise does not belong. The showcase game of the weekend was the Cowboys Classic: Alabama and Michigan. Aside from Michigan’s defensive stand on the first series, this was a complete non-game. Alabama nearly shut out the Wolverines in the first half, and they scored 31 of their own points in that time, on their way to a 41-14 rout. As Tommy Tomlinson put it, “Michigan even lost the Kiss Cam.” While Alabama surely is a better team than Michigan will face the rest of the season, I’m not convinced that the Tide exactly overpowered the Maize & Blue. What I saw was the execution of a defensive gameplan to allow Denard Robinson to beat himself by throwing it as much as he wanted. To this casual observer, it felt like he was connecting with guys in crimson as much as he was with the guys in white. I was a casual observer in part because the Clemson/Auburn game happening at the same time was far more compelling. On their opening drive, I thought Clemson was the best offense I’d seen all weekend. They soon remembered who they were, but they did earn a victory in the fourth quarter, all without their best player, WR Sammy Watkins. I haven’t looked at their schedule, but I imagine this year will go much like last year for those Tigers, in that they’ll start out very strong, maybe opening 5-0, before imploding in heart-breakingly spectacular fashion. Should be fun to watch, especially with Robbie Caldwell now on Dabo Swinney’s staff. The Clemson/Aubrun game highlighted one of the officiating trends that is sure to drive me nuts all season. Even worse than the excessive celebration penalties (you decide what the adjective “excessive” is modifying) is this helmet rule, pursuant to which players whose helmets come off during a play due to any cause other than an opposing player tearing it off must sit out the subsequent play. Obviously I wasn’t the only one who noticed a larger-than-average number of helmets coming off during play last season. The reason for it is obvious: guys want to wear those lids loose, like Michael Vick. People called the NBA’s dress code racist, and now we have a league full of seven-foot hipster nerds. I can’t wait to see what sort of absurd headgear these kids roll out over the coming weeks and seasons, should this rule with no obvious basis in anything other than some old dude wants to demand that those punk kids strap their helmets on tight persist. 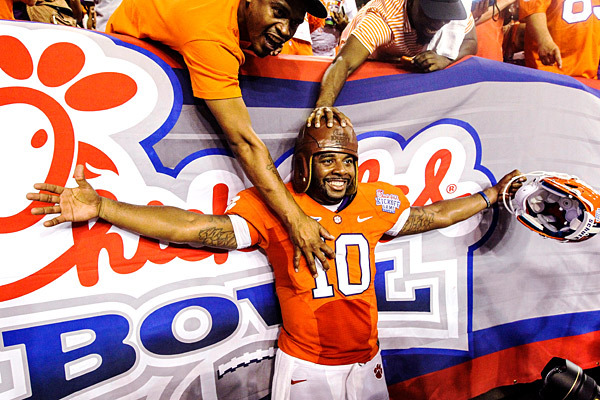 Tajh Boyd went with the leather helmet after losing his usual one several times on Saturday night against Auburn. 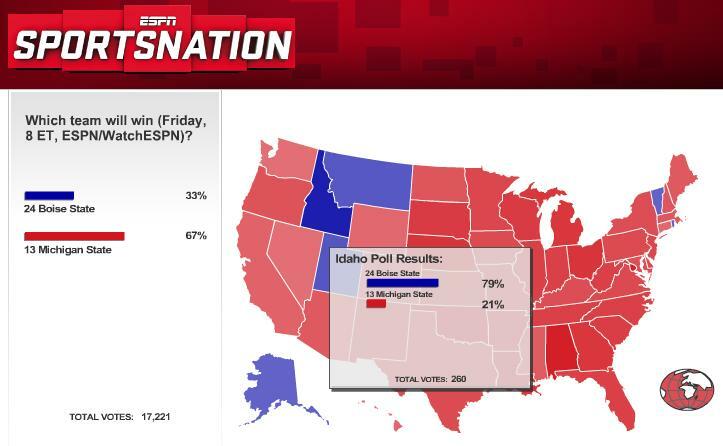 As my favorite ESPN.com feature illustrates, the rest of the nation, and indeed the world, agrees with me. By now your eyes have been drawn to a few exceptions, of which there are two kinds. The first is less interesting for sports purposes. These are usually low-population states, and their apparent bucking of the trend usually is the result of a near-even split of a very small number of participants. Here, those states are Alaska (23), Vermont (20), and Rhode Island (45). Social scientists probably have something to say about this interactive map as a tool to measure things like local awareness of broader issues and the availability of internet access. The truth, of course, is that all voters are of the second type. Or, at least, we all approach the extreme of the second type in positive correlation with the strength of our emotional connection to at least one of the teams involved, and I’m really ok with that. In fact, I love it. Boise State players will no longer sport their all-blue uniforms for conference games on Bronco Stadium’s iconic blue turf, the result of a concession school officials say they made last year as part of the team’s entrance into the Mountain West Conference. League Commissioner Craig Thompson said Tuesday during the league meeting that coaches believe Boise State gets a competitive edge when players wear blue helmets, jerseys and pants at home. The Broncos have worn all blue at home for several years and built a 77-2 record and a 32-game winning streak on their home turf since 1999. Coach Chris Petersen said his team intends to wear the signature uniforms for nonconference games against Tulsa and Nevada, but he finds the restriction for league games silly and an erosion of the team’s identity. Beyond the silliness, there’s the obvious inconsistency with the policy, since it only applies to Boise State and not, as many have noticed, to other MWC members whose football teams wear similarly camouflaged uniforms and have done so for years. Colorado State, a charter member of the MWC, dresses its players in green and uses green turf at its home Sonny Lubick Field. How many CSU football players appear in this picture? Craig Thompson can’t tell.